It is our pleasure to share with you the August edition of the Wave. In this edition, we are celebrating Membership month. The importance of membership to Rotary cannot be over-emphasized. Members are the lifeblood of the organization. Without them, there will be no Rotary. Therefore, and naturally, the District Membership & Extension chairs from Tanzania and Uganda, share tips on what clubs need to do to increase and engage our members. This is especially critical for Tanzania with the looming 2021 deadline when the District will be split. Our inspiration Rotarian of the month features an amazing young man who, despite losing everything and having to start a new life in a foreign country as a refugee, all by himself, is making a positive difference in his refugee community. Rotaractor Paul Musha is one of the founder members of the Rotaract Club of Nakivale, established in a refugee settlement, to help the neediest members in the community, especially the elderly who are often neglected. Rotarians in the District took a moment to remember RIPE Sam Awori. It is now one year since his untimely demise. My his soul continue to Rest in Peace. 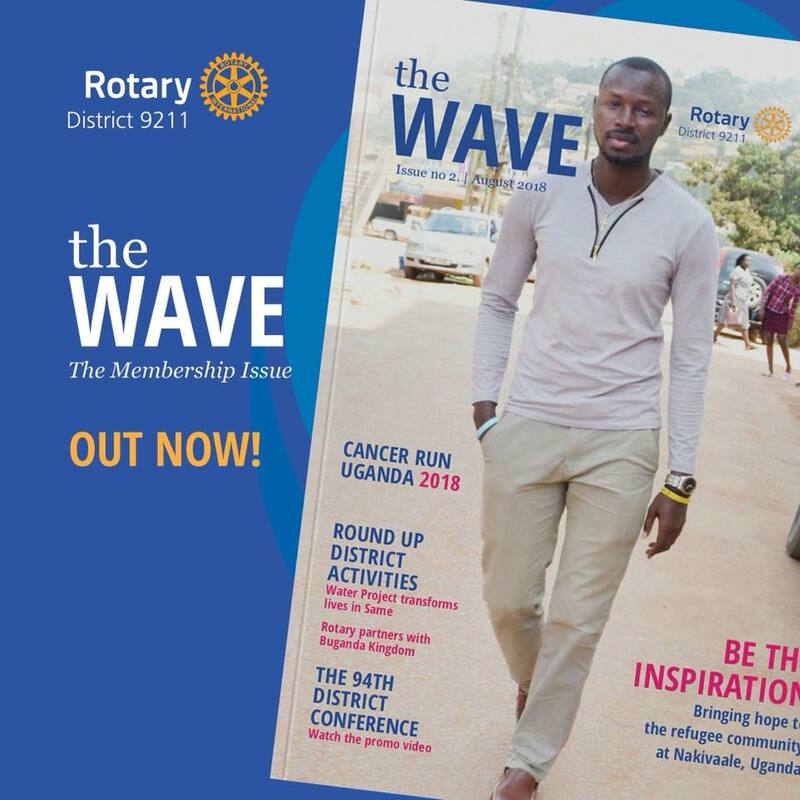 We also bring you news from around the district, featuring clubs and their activities and upcoming activities including the Rotary Cancer Run 2018 slated for 26 August 2018. This year, the goal is to raise funds for the construction of a bunker for the Linear Accelerator at the Rotary Centenary Bank Cancer Ward in Nsambya Hospital. In this edition, we are also excited to launch the DG’s photo contest for District 9211. The winners of the contest will be announced at the 94th District Conference and Assembly in Dar es Salaam, Tanzania, next year as well as the photographs featured in the district year book. So, go ahead, take and share many photos of your club events and activities. See the submission guidelines on the last page of the Wave. We will not forget to thank everyone who send us their stories and photographs. Please keep them coming.